The external iliac arteries are two major arteries which bifurcate off the common iliac arteries anterior to the sacroiliac joint of the pelvis. 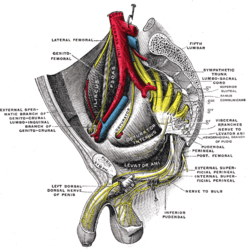 They proceed anterior and inferior along the medial border of the psoas major muscles. 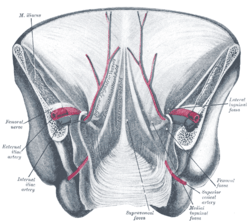 They exit the pelvic girdle posterior and inferior to the inguinal ligament about one third laterally from the insertion point of the inguinal ligament on the pubic tubercle at which point they are referred to as the femoral arteries. The external iliac artery is usually the artery used to attach the renal artery to the recipient of a kidney transplant. 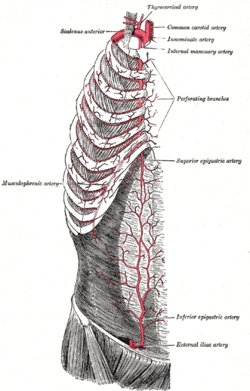 Inferior epigastric artery Goes upward to anastomose with superior epigastric artery (a branch of internal thoracic artery). 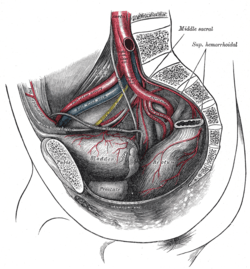 Deep circumflex iliac artery Goes laterally, travelling along the iliac crest of the pelvic bone. 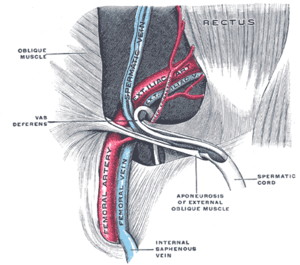 Femoral artery Terminal branch. 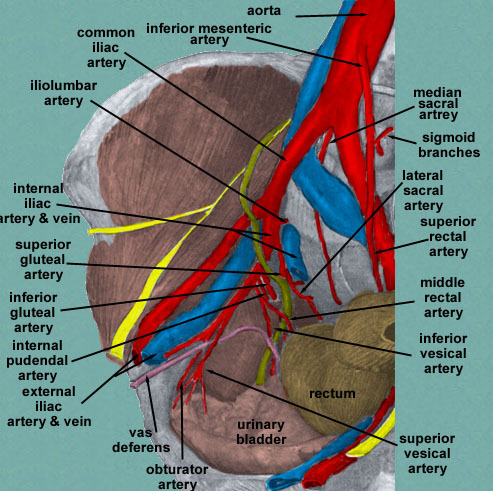 When the external iliac artery passes posterior to the inguinal ligament, its name changes to femoral artery. The abdominal aorta divides to form the "common iliac arteries" in the lower abdomen, and these vessels supply blood to the pelvic organs, gluteal region, and legs. 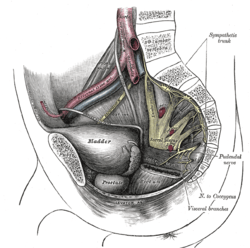 Each common iliac artery descends a short distance and divides into an internal and an external branch. 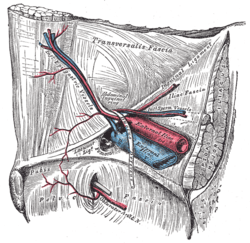 The external iliac artery provides the main blood supply to the legs. It passes down along the brim of the pelvis and gives off two large branches - the "inferior epigastric artery" and a "deep circumflex artery." These vessels supply blood to the muscles and skin in the lower abdominal wall. The external iliac artery passes beneath the inguinal ligament in the lower part of the abdomen and becomes the femoral artery. The internal mammary artery and its branches. ↑ Tortora, Gerard J.; Grabowski, Sandra R. (2003). Roesch, Bonnie, ed. Principles of Anatomy and Physiology: Volume 4 Maintenance and Continuity of the Human Body (Textbook). 4 (10th ed.). New York, NY: John Wiley & Sons, Inc. p. 734. ISBN 0-471-22934-2. Gray's s173 - "The veins of the lower extremity, abdomen, and pelvis"
Anatomy photo:43:12-0104 at the SUNY Downstate Medical Center - "The Female Pelvis: The External and Internal Iliac Vessels"
Anatomy figure: 43:07-05 at Human Anatomy Online, SUNY Downstate Medical Center - "Sagittal view of the internal iliac artery and its branches in the female pelvis. "